"Afghanistan is a country where the British have been badly defeated in the past." There is no denying it - British forces, indeed any foreign force, have rarely done well in Afghanistan and certainly not for long. 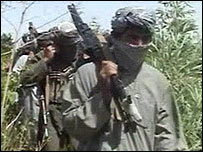 That statement was made this month by a Taleban commander in Helmand province - by way of a warning. Thousands of British troops are already being flown into Helmand - to the biggest base to be built from scratch since World War II. It is a huge tented encampment in the desert of southern Afghanistan, where the wind whips up a sandstorm every other day and the fine, talcum powder sand seeps its way into everything. There are venomous scorpions and spiders, but the real danger is the insurgents who want to kill or injure the international troops with suicide car bombings or roadside bombs. A Taleban commander in Helmand spoke to an Afghan BBC journalist and used history as the focal point for his war on the expanding forces. "Afghans are not scared of death and can sacrifice their heads and hearts," he said in Pashtu, the language of Pashtun Afghans. "The British are an old enemy and were defeated with ordinary weapons. Our resources are getting better every day and we have good fighting skills. "We are good at guerrilla war and we will apply these tactics the way our forefathers did against the British." They are strong and not unfounded words - the number of suicide bombs detonated so far this year in Afghanistan has already equalled the number of attacks in the whole of last year. As he spoke on the video camera, a group of Taleban fighters carrying AK-47s and rocket-propelled grenades walked past behind him. This was just a couple of weeks ago. Security in the south has been deteriorating over the past few months. 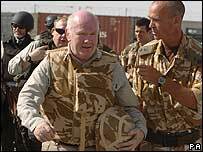 That is what the British troops know they will be facing and what British Secretary of State for Defence John Reid came to Helmand province to hear about first-hand. Security was what he talked about and what he experienced. On landing in a Chinook helicopter in Lashkar Gah, the capital of Helmand, the threat of attack had gone from "severe" to "imminent", with the Ministry of Defence saying "intelligence showed all the indications of a terrorist attack". That attack never came but it could not have been a more stark reminder of just how dangerous the British deployment is going to be. Brigadier Ed Butler is commander of the British forces in Afghanistan, and he speaks of being realistic about the threat of casualties. "At the beginning of every operation there is a rocky period and we should prepare ourselves for some setbacks," he said. "But that should be set against those opportunities which I genuinely think are here for the taking." Those opportunities are for Afghanistan to get back on its feet after decades of war. The role of the British and the other Nato-led forces in the south of the country will be to provide the security that is so necessary for the reconstruction teams, the non-governmental organisations and, of course, the government. But if the Taleban commander's reminder of history was not enough, the DVDs being handed out on the Pakistan border to recruit fighters demonstrate organisation and training. The images, professionally edited and presented, run with a background of religious chanting and show foreign fighters being taught tactics on blackboards in classrooms. Alongside images of international forces being hit by roadside bombs is footage of these devices being made - it is half inspiration and half training manual. And it is in Pashtu - they are trying to recruit Afghans. There have been rumblings in the UK that the troops - which will peak at 5,700 personnel in the summer - are insufficient and not well enough armed. Mr Reid denied this but then the next day announced that a squadron of Harrier Jump Jets - the perfect aircraft to protect and back up ground troops - would remain in Afghanistan another year. 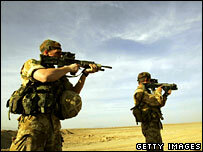 It is costing £20m but the sighs of relief were heard across the British bases of southern Afghanistan. The weeks ahead are going to be difficult and dangerous - and the Nato-led troops will be here for many years. The chance of helping Afghanistan back on its feet is a noble aim and some would say the least they could do after all that has happened in a century or more. But it is also selfish, as the West never wants Afghanistan to be able to host global terrorists with such impunity again.